Charlie Sheen's infamously loose cannon sparked a massive blaze that took weeks to flame out. It all started when Sheen went on conservative talk radio's Alex Jones Show in February. 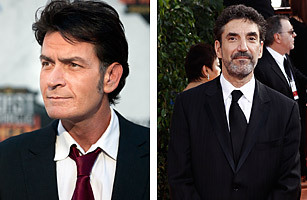 Fresh off a stint in rehab, Sheen interjected an anti-Semitic comment about Two and a Half Men producer (and his boss) Chuck Lorre, who had been forced to downsize the show due to Sheen's problems. ("There's something this side of deplorable that a certain Chaim Levine  yeah, that's Chuck's real name  mistook this rock star for his own selfish exit strategy, bro.") The next day, CBS suspended the show, and Sheen embarked on his now-infamous media blitz and continued to take potshots at Lorre. Two weeks later, CBS officially fired Sheen from the sitcom. While Men's future lay in jeopardy, Sheen continued to lay waste to the TV franchise that made him the highest-paid sitcom star, even filing a $100 million lawsuit against the studio to claim unpaid wages for him and the show's crew. But Lorre had the final word, hiring the straight-laced Ashton Kutcher to take Sheen's place.